Welcome to the World's Greatest Online Feng Shui Calculator! The Flying Stars (numbered 1-9) represent the type of Chi present in each sector of your home. ... All rendered online over your home's floorplan!!! Feng Shui is the science of manipulating the Chi or Qi in our homes. Chi is inherent in all matter. The classics say, "If it has form, it has Chi". Feng Shui manipulates the Chi in our homes just like Acupuncture manipulates the Chi in our bodies, Chi enters our homes through openings like doors and windows just like Chi enters our bodies through breathing. One interesting thing about Chi in the application of Feng Shui is that Chi does not flow through walls. It will follow the outline of wall. This has its advantages... we humans can wall off parts of our home that may contain bad Chi thus rendering it harmless, more on this in the Flying Star discussion. Sheng Chi or Good Chi is beneficial. It flows slowly into our homes. It does not move in a straight line but in circular patterns. You can visualize the pratice of Tai Chi, with its slow motion and unified body movements. This is how Chi flows; smoothly, slowly, deliberate yet effortlessly. Shar Chi or Bad Chi is not beneficial. It is the result of structurally straight uncurved surfaces with edges, like overhead beams, buildings with sharp edges, or a straight road. The Shar Chi speeds off the structural edge and disrupts all things in its path. This is why the Chinese design their buildings with curved roofs. In Compass School Feng Shui, the Chi that exists in the home is dependent on the compass direction that the home is "facing". The home's facing side is typically the main view of a home. Think about taking a photograph of your home for a real estate listing. In most cases, the photograph that you take will show the facing side of your home. The photo on the left shows the facing side of a home. In this case the front door is also located on the facing side. Here we would measure the facing degrees by looking out the front door from the inside and measuring the compass degrees that you are facing (looking out). The satellite image on the right shows the "FSCALC Virtual Compass" in action. The compass is adjusted for magnetic north. 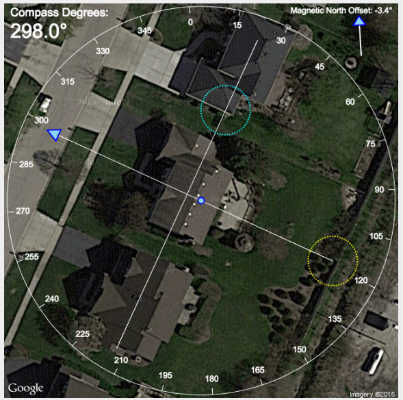 The compass shows that this home is facing 298 degrees. 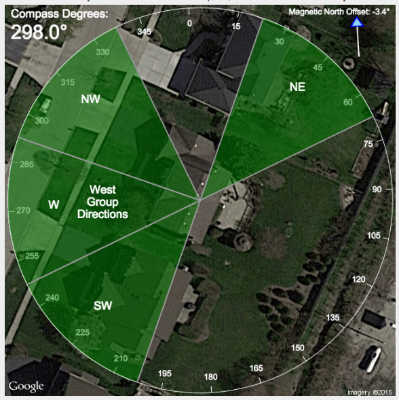 This website offers powerful tools that make it easy to find the facing direction and to analyze a property. 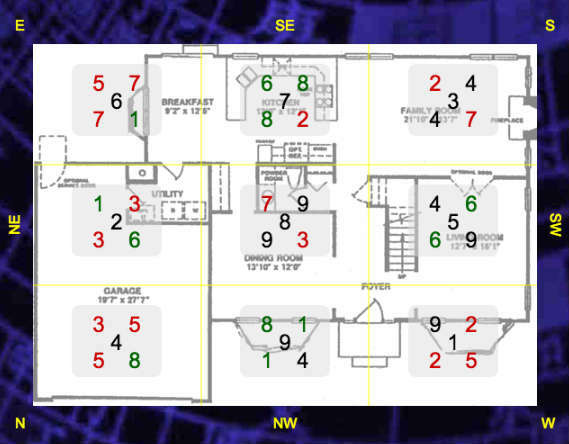 This website allows you to upload your own floorplan to use in the Feng Shui Calculators. In a traditional Feng Shui analysis the floorplan is rotated to show the facing direction pointing down. This floorplan rotation has been a major point of confusion in learning Feng Shui because it is sometimes very difficult to visualize your floorplan's orientation in relation to the compass directions. This website eliminates this confusion! Your floorplan image file can be any size. 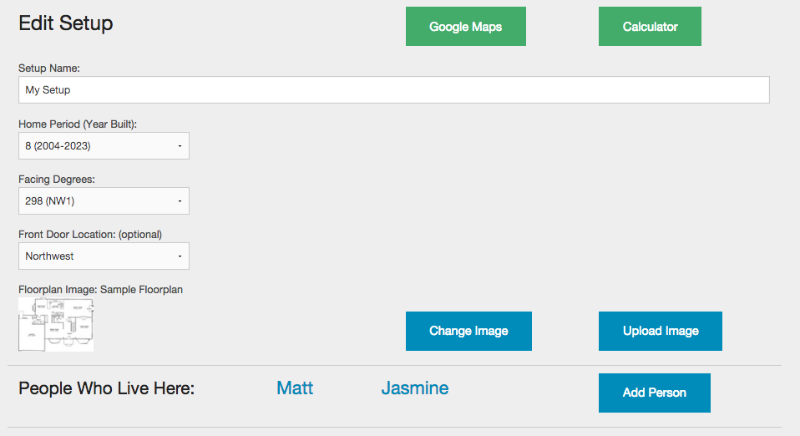 The system will automatically scale and store your image to fit the Calculator pages. The image file formats allowed for upload are jpg, jpeg, gif, and png. 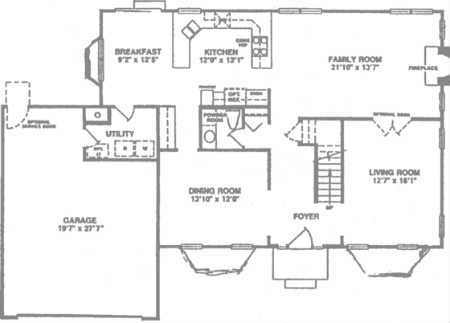 The website also provides blank generic floorplans like (Wide, Long, X-Wide, etc.) images to use if you don't have a floorplan to use. It's easy to hand sketch a floorplan layout then take a picture of it with your cellphone and upload! Everyone has a Kua Number. Your Kua Number is based on your gender and year of birth. Your home also has a Kua Number based on its sitting direction (sitting is 180 degrees opposite of facing). The Setup calculates all the Kua Numbers for you. There are 2 groups of directions, with 4 cardinal directions each. 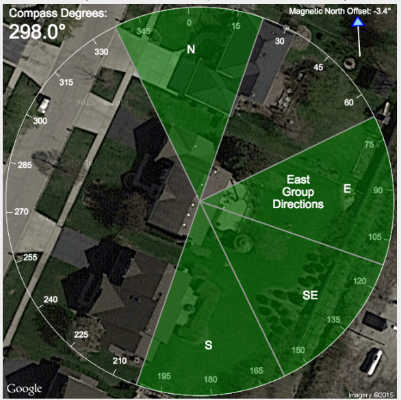 The "East Group" is comprised of directions N,S,E,SE and the "West Group" is comprised of directions SW,W,NW,NE. People with East Group Kua Numbers (1,3,4,9) should face East Group directions and people with West Group Kua Numbers (2,6,7,8) should face West Group directions. In particular, people should sleep with their heads pointing to one of their 4 favorable directions. The home's natural sitting direction determines which Group the home belongs to. For example if a home sits Southeast (faces Northwest) then it is a East Group home with a Kua Number of 4*. *Note: There are some Masters that use the facing direction of the home to determine the House Kua where the Sheng Chi direction is always at the front of the home. In this case the home facing Kua is treated the same as a human facing Kua. But according to Classical Feng Shui texts the sitting direction should be used. In this case the human is walking into the home's entrance (as opposed to facing out) according to the human's West Group / East Group directions. Put another way, if you are walking into or approaching a home in one of your good directions then that home is compatible with you. In the past this website used the facing approach in determining the House Kua. It now uses the Classical approach. Before buying or renting a home you should check that your family's Kua Numbers and the home's Sitting Direction are in harmony. This website makes it easy to do! I know what you're thinking. What if some of my family members belong to different groups? Don't worry too much because there is also the concept of the home's "Sitting" direction, that is the direction that the back of your house faces. (The opposite of your Facing direction). Most directions have different West/East Group facing and sitting directions. 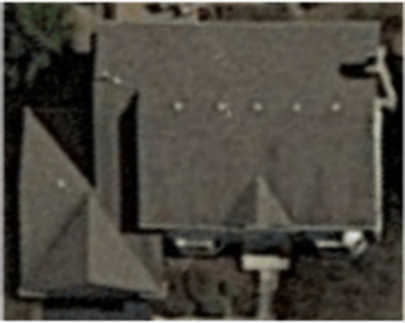 For example, the house above is facing NW and sitting SE. Because of this the West Group house still has some affinity to the East Group person. Care should be taken though when moving into a house on the NE-SW axis and the N-S axis. These are pure West and East group directions. 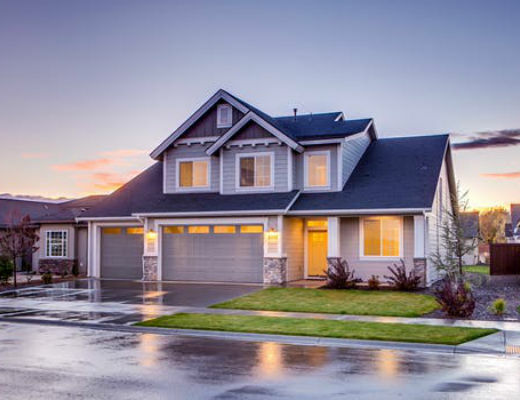 It is recommended by many Masters that the family breadwinner should take precedence when deciding about a home to move into. Though some Masters would recommend moving out of the house if the polarities are off too much. But still, there are Feng Shui cures for these problems using 8 Mansions analysis. The Setup is used to store information about your home that does not change with time. You will create a new Setup for each building that you analyze. The most important parameter is Facing Direction, the other parameter is Home Period, that is, what 20 year period in which your home was built. The Home Period is used in Flying Star anaylsis. If the Home Period is unknown then you will not be able to determine your lucky Mountain or Water Stars in Flying Star, but you will still be able to use the Yearly and Monthly Flying Stars. More on this later. Flying Star (Xuan Kong) Feng Shui takes into consideration changes in Chi in your home as a function of time. Here the Chi is represented by the numbers 1 thru 9. 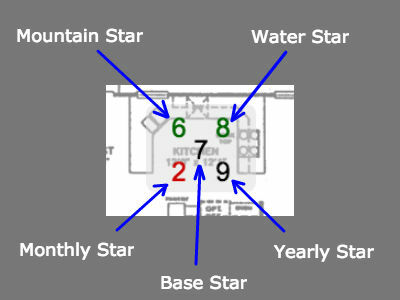 For each grid sector the middle number is the Base Star, the upper left is the Mountain Star, the upper right is the Water Star, lower right is the Yearly Star, and lower left is the Monthly Star. The Mountain, Base and Water stars are fixed, that is they do not change in time and are calculated using the year that the home was built and the facing direction. The Yearly and Monthly stars do change with time and it is interesting to see how they interact with the other stars and directional elements every month and year. The pattern that the stars follow is based on the original Lo Shu 3x3 grid where all rows and columns add up to 15. The arrows represents the path that the stars fly. Flying Star calculations are difficult to do and require the use of a Lo Pan. 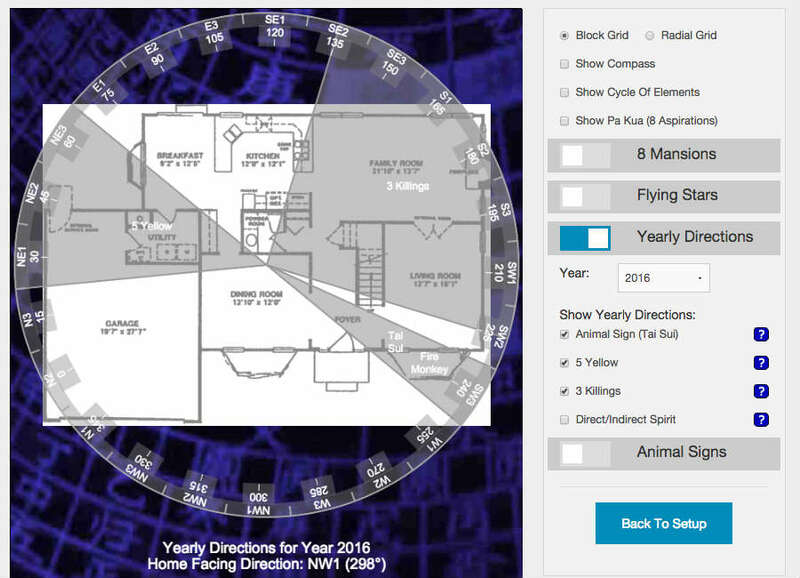 This website does the calculations and displays the results over your floorplan in an instant! One should also consider the "prosperity" of the stars relative the the current 20 year "period". For example in Period 8 (2004-2023) Star 8 represents "current prosperity", Star 9 represents "future prosperity", and Star 1 represents "future future prosperity". All of these stars are considered good and should be enhanced in period 8. In Period 9 (2024-2044) the good stars will be 9,1 and 2. Note that even though Star 2 (Sickness) is considered bad in general, it also shows it's positive side in periods 9,1 and 2. The 8 Star will be weakened in Period 9 and will not be "useable". In that case activating the good 8 Star in Period 9 will not result in a noticable change in the Chi flowing in the home. The bad stars should always be drained ("cured") in all non-prosperous periods. For example Star 5 (earth) should always be drained with Metal except in periods 3,4 and 5. External Forms: External Forms are elements occuring outside of your home. For example consider a swimming pool outside of your home, the pool will activate the Water Star in that sector of the home. Another example is a hill behind your home, the hill will activate the Mountain Stars in that sector(s). External forms are the strongest of the 3. Internal Functions: Here the function of the room determines the Star that is activated. For example a bedroom is Yin and will naturally activate the Mountain Star. A front door is Yang and will naturally activate the Water Star. The function of a room is 2nd strongest. For example if there is a swimming pool outside of your bedroom, the Water Star will be activated by the pool even though it is a Yin bedroom. This may be a good thing depending on what stars are present. Element Placement: The Mountain Stars are activated with Earth elements, like boulders or crystals. The Water Stars are activated with Water, like a water fountain. In Period 8 You will definitely want to try to activate the number 8 Mountain and the 8 Water Stars. They will occur once each in your Flying Star chart. You will also want to drain the unlucky 2 and 5 Earth elements with metal, like a 6 rod hollow metal windchime. The Yearly and Monthly Stars will also interact with the Mountain and Water Stars as well as the directional elements according to the Cycle of The Elements. We use the more elegant exhaustive and constructive cycles inside our homes. The destructive cycle is too harsh of an interaction to use in our homes. It is recommended that you read a book on Flying Star that will go into more detail than what is presented here. Lillian Too's "Secrets of your House Charts" is an excellent book to help you understand this and all functional aspects of this website. 8 Mansions Continued: We have already begun to cover 8 Mansions Feng Shu with our discussion of East/West groups and Kua numbers above. 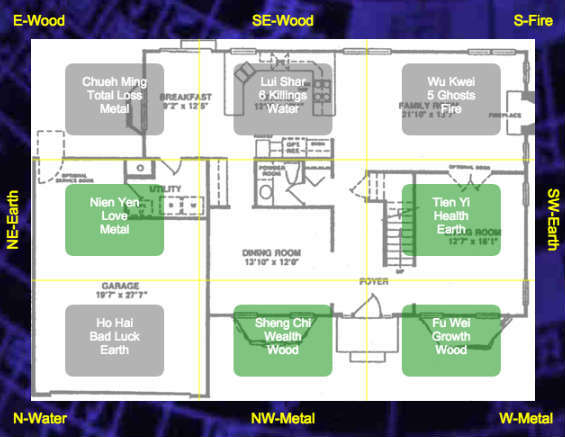 In 8 Mansions, each Kua Number has 4 good directions and 4 bad directions to consider. The 4 good directions are Sheng Chi-Wealth, Fu Wei-Growth, Tien Yi-Health, and Nien Yen-Love. The 4 bad directions are Chueh Ming-Total Loss, Lui Shar-6 Killings, Wu Kwei-5 Ghosts, and Ho Hai-Bad Luck. Each Kua Number has a different arrangement of these directions. These directions hold true for both buildings and people. For Buildings: For buildings, it is recommended to use Flying Star over 8 Mansions for cures and enhancements. However, if you do not know the year that the home was built you would not be able to calculate the Base, Water or Mountain Flying Stars. In that case, you would use 8 Mansions to analyze the Chi. (Note: The Yearly and Monthly Flying Stars should still be used in all cases). Enhance the Good Directions: For 8 Mansions, each sector of the home contains an 8 Mansions direction. Each 8 Mansions direction has an element associated with it. Those elements in turn "visit" the cardinal direction's element. For example, the Sheng Chi-Wealth element (above) is Wood. In this case, Wood is visiting the Northwest's Metal. We want to enhance the Wood but the Metal is trying to destroy it. This is where the Cycle of the Elements is used. The solution is to add Water. The Water will simultaneously drain the Metal and enhance the Wood, a win-win! Suppress the Bad Directions: For the bad directions, we want to subdue the element. For example the Lu Shar's Water (above) is visiting the Southeast's Wood. Here we want to drain the Water, but the Southeast's Wood is already doing this. In this case, we would do nothing since the Water is being subdued by the Wood naturally. For People: For people, 8 Mansions is used to define what are the good and bad directions to face. The analysis holds true for all places that the person visits (i.e. your bedroom, office, school, restaurants, conference rooms, etc). For example you would not want your desk at work to face your Total Loss direction. The obvious solution would be to change the desk's orientation. In the case where this is not possible, you can use the Cycle of the Elements to subdue the Chueh Ming's element in that direction in your office or cubicle. When all else fails you could also face a direction that is good for your Animal Sign. More on this later. Here the Yearly Directions Tool is showing the important directions for the year 2016. It is a Fire Monkey Year and the direction is 240 degrees. The Yearly Directions Tool also displays the traditional 5 Yellow, 3 Killings and Direct/Indirect Spirit directions for any given year. Wow! 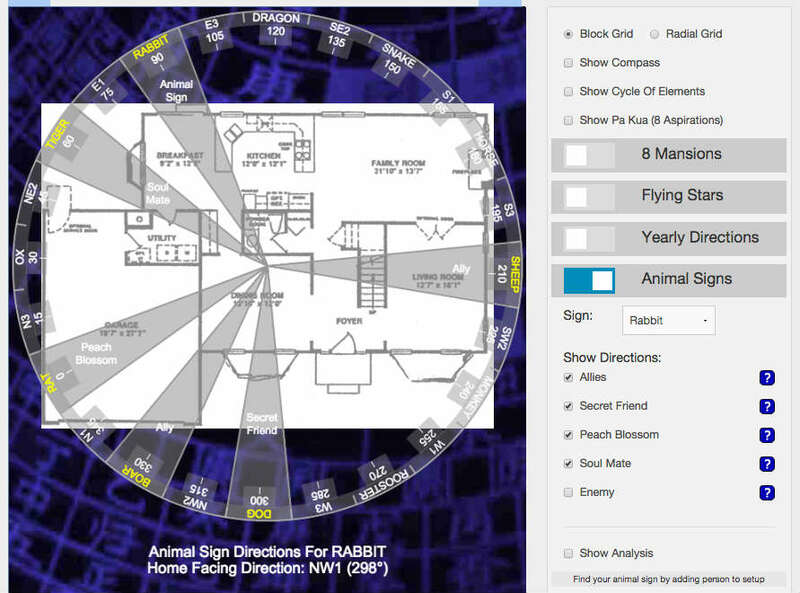 Here the Animal Signs Tool is showing the important directions for a Rabbit. Every Animal Sign has a unique set of directions that represent their Allies, Secret Friend, Peach Blossom, and Soul Mate. Copyright © 2016-2019 Flying Star Masters Inc. If for any reason you are not happy with our Google Maps Virtual Compass, contact us and we will issue a refund. Within 30 days, if for any reason you are not happy with our service, contact us and we will issue a refund.